Multiphonic works for alto saxophone / [performed by] Franziska Schroeder. Contents note: NASA's ark / Peter Boyd -- Killing harlequin / Steven Campbell -- Frantaphonics / Eric Gross -- Improvisation in emerald green / Jody Kingston -- Ich lass dich nicht / Raffaele Marcellino -- Movement 1 / Miloslav Penicka -- Laid down on stones / Margery Smith -- Croutons VIII / Benjamin Thorn. Capture session: Recorded at Tasmanian Conservatorium of Music, Hobart, 11th - 13th September 1998. Performers: Franziska Schroeder (alto saxophone) ; Helen Arnold (piano: Penicka). CD created as part of Schroeder's 1998 Honours project. Score: Croutons VIII : for saxophone / Benjamin Thorn. Score: Frantaphonics, op. 228 : for E flat alto saxophone / Eric Gross. Score [ePDF]: Croutons VIII : for saxophone [eScore] / Benjamin Thorn. Score [ePDF]: Frantaphonics, op. 228 : for E flat alto saxophone [eScore] / Eric Gross. 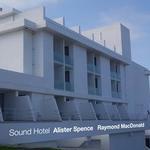 CD: Sound Hotel / Alister Spence, Raymond MacDonald.